A pleasing mix of pink, white and red giant peonies that are equally wonderful in both cut-flower bouquets and late-spring borders. Grows 2-3 ft. tall with blooms up to 12 in. in diameter. Prefers full sun to partial shade. Zones 3-8. No. 1 root divisions. One offer is 3 plants. For each offer ordered, get 3 plants..
Spacing: 24 to 36 inches. 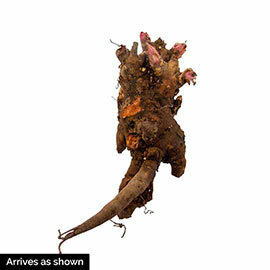 Depth: Plant with the crown of the plant 1 inch below the soil. 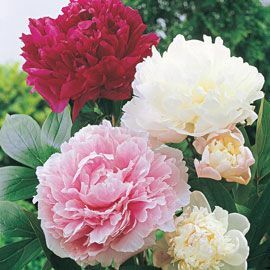 If planted deeper peonies may not flower. Color: Varied - this is a random mix of colors. Foliage: Glossy, deep green foilage that is very attractive and ornamental throughout the growing season. Form: Perennial, shrub like mound. Flower Form: Heavily petaled 6 - 8 inch blooms. Soil Requirements: Well-drained, humus enriched soil that is moisture retentive. Growth Rate: Slow the first 1 - 2 years, after that, growth is moderate.